There comes a time in life (or in this case the lifespan of a festival) when you have to ask important growth questions, "Are we evolving?”, “Are we sticking by our roots?”,“Are we truly leaving each Campout for the Cause more inspired and connected?". Campout was never about any one band or person, our goal has always been to create an authentic TRIBE. We set out to cultivate a comfortable setting, in which to inspire, the true artistic moments that seem to organically occur when creative and passionate people come together. 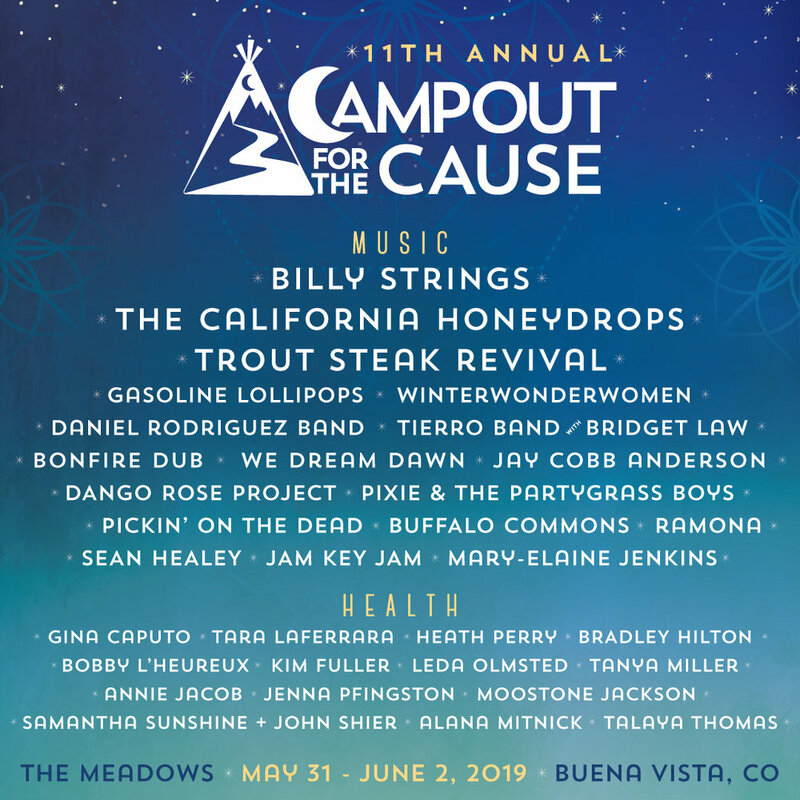 Campout is curated to reflect a community that wants to play and participate in the entire experience of a gathering, we do our best to book talent to be present for the complete experience. Whether it's sharing a warm cup of coffee on a crisp spring morning, or tipping back a beer with new friends from points North, South, East and West, our artists are onsite to enjoy the experience as well. The CAUSE has always been at the forefront of Campout and over the last few years, the costs of producing the event left little to donate. Two years ago, with this factor in mind, the team dug in and decided it was the right time for another physical move; we had started at Rancho, moved to State Bridge, headed back to Rancho and finally have partnered with our good friend and landowner, Jed Selby, to ultimately find the ideal home in beautiful Buena Vista. 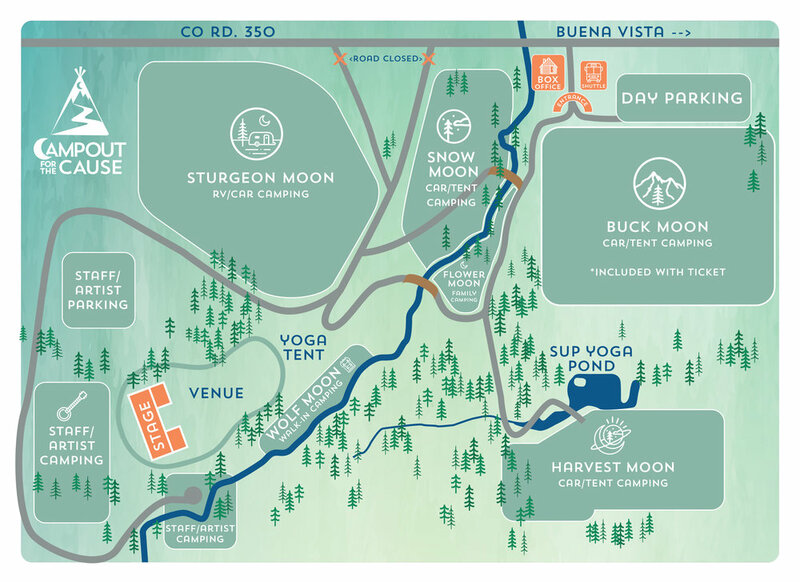 The Meadows is an idyllic property for our community based, eco-conscience gathering, located just minutes from the historic and evolving mountain community of BV and nestled under the fourteen thousand foot Collegiate Peaks. This private, green grass blanketed, cottonwood shaded and absolute positive vibration filled land, will host us once again for our small and nurturing gathering. So take a chance on us, join us for what will surely be a unique and unforgettable festival experience and contribute to the essence of gathering, not as an attendee, but as a family member! All bodies~ Ages 16+ ~ All levels welcome! Join AcroYoga enthusiasts/innovative massage therapists Samantha Sunshine and John Shier, from the Sunshine Massage Studio in Lionshead Ski Village, for an unforgettable and super enjoyable evening of AcroYoga and Thai Massage in our community room here at Eagle Rock gym! John and Sunshine guide you through the FUNdamentals of AcroYoga: basing, flying, and counter balancing while finding effortlessness and alignment. Literally soar to new levels in your focus, strength, and stretch practice! Experience a gentle “cool down” of Thai massage to lengthen the spine and soothe the body's soft tissue. We give extra special attention to teaching stretches that promote healthy hands, wrists and forearms. Connect with other gym rats, climbing monkeys, and yogis in ways that affirm and expand your ability to trust and “let go”. Recharge the body, laugh upside down, walk (float) away with priceless photos, and truly GROW in a supportive, safe, encouraging environment! It’s your time to Shine️🌞, Fly, and climb to new heights! Pre-Registration Preferred. Drop Ins welcome. Catch all 4 of the fundamental AcroYoga workshop classes this March, 6:30-8pm. Join us afterwards for a free, fun, practice jam 8-8:45! You won't want to stop flying. All levels, all bodies welcome! No partner required. Spread the word to your buddies, co-workers, family, and fellow healers. Join AcroYoga enthusiasts/innovative massage therapists Samantha Sunshineand John Shier, from the Sunshine Massage Studio in Lionshead Ski Village, for an unforgettable and super enjoyable evening of AcroYoga at the Aria Club in Vail! Literally soar to new levels in your focus, strength, and stretch practice! Experience a gentle “cool down” of Thai massage to lengthen the spine and soothe the body's soft tissue. We give extra special attention to teaching stability, to give you sustained health in this practice. Connect with other Vail valley yogis, skiers, boarders, climbers, lovers-of-life, in ways that affirm and expand your ability to trust and “let go”. Recharge the body, laugh upside down, walk (float) away with priceless photos, and truly GROW in a supportive, safe, encouraging environment! It’s your time to learn AcroYoga: Shine️ & Fly to new heights! How long has it been since you were last inverted? Too long, we know... Let's fix that this Wednesday at our AcroYoga Jam at the Lionshead Gondola. No partner? No problem. Come for a FREE, fun, flying-good time-Beginners welcome! Come with the good vibes and leave with new friends and circus tricks that will be sure to blow up your gram. Tell a friend! And bring a yoga mat, snacks and lots of water. Join us for the 5th Annual Eagle YogaFest! 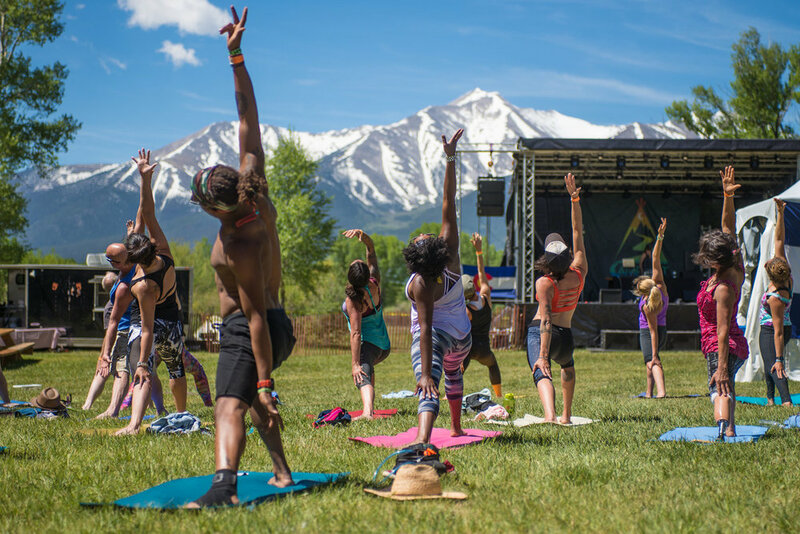 Eagle YogaFest is a different kind of yoga festival set in the quaint town of Eagle, Colorado (just west of Vail). Experience a relaxing weekend of Lunar Flow, Aromatherapy, Yoga Nidra, Slow Flow, and more. For our 5th anniversary we are also excited to bring you more live music! This year we are excited to feature Kevin Paris, Kirby K, and more! This is the yoga festival for Every Body. New students and advanced practitioners are welcome. Relax, renew, and restore while enjoying the unmatched, picturesque views of Eagle, Colorado. There is a wonderfully packed schedule of yoga classes at Arise festival, and this year Sunshine will be teaching an Introduction to AcroSage, with the creator of the technique, Benjamin Marantz, featuring beats by Moon Frog. AcroSage is an acrobatic massage sequence that simulates soul rebirth. Elements in this massage work include reflexology, sound healing and traction alignment. It is similar to an interactive and dynamic partnered AcroYoga and unique in that one person plays an active and supportive role while the other surrenders and receives. In this class, we will be exploring 5 simple, yet profoundly therapeutic holding positions to guide “the flyer” and “the base” through a safe and empowering experience. This restorative “AcroYoga-like” class is designed to slow down the mind, release blocks and nurture the soul. Other side effects include spontaneous laughter, a feeling of lightness and emotional liberation. Are you ready to deeply align with women who are walking the same journey as you and create deep, lasting, healthy relationships with powerful women? The fact is there are plenty of retreats you can choose from, but if you are wanting to finally LIVE a LIFE you LOVE and create deep and lasting friendships, then this is YOUR time and YOUR retreat! Welcome to “It’s Your Time To Shine: Women’s Retreat” by Danette May! Experience life-changing shamanic massage journeys by Samantha Sunshine at the Sunshine Massage Studio. On Friday, we will dive deep into trust and Sunshine will lead an AcroYoga workshop where we will focus on using flying as a metaphor for life and confront fears around not getting enough support. Join us for a week in paradise engaged in AcroYoga, connection, commUNITY, yoga, meditation, massage, non-stop reggae, coconuts, and FULL immersion into the earth elements. Click here to see a video of that last festival. This photo and video was taken by the talented AcroYogi Justin Bench. Next year's festival will be April 10-15, buy tickets now!